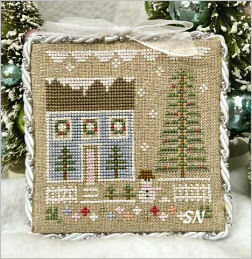 A cute holiday decoration, this measures 4-1/2 x 9-1/2 on 32ct linen. 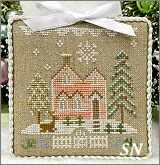 It'd be kind of cute split apart and stitched on three sides of a cube -- even better if you left the top open to store a pad of paper and a cute Christmas pen! 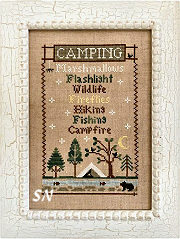 Country Cottage's new design... this celebrates camping! I know it's a tent down at the bottom -- reminds me of the Louvre! I think I see the flashlight sparkle in there... anyway, it's cute! 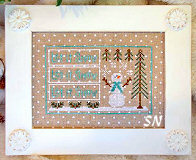 Finishes approx 5 x 8... with the words, bottom scene is 50 x 80 -- about 3 x 5. Charted for DMC and Classic Colorworks flosses. 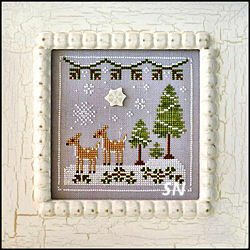 Here's a fun little 4 x 4 design to make you smile. 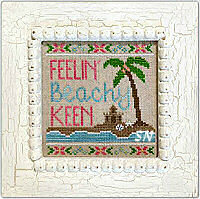 Presented as a small chart, you could add some beads to the sand, maybe a couple of wooden beads for the coconuts? Blue metallic filament in the water for a bit of shine... and even add some baby shells (Hobby Lobby has them in the bead section) by that little castle! 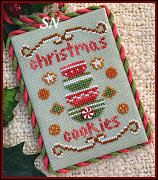 Coded for both DMC and 3 shades of Classic Colorworks hand-dyed floss. 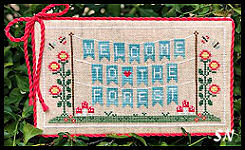 7 Designs, releasing once a month for the next 7 months, the first design -- Forest Banner -- is larger than the rest and has a stitch count of 121 x 67. 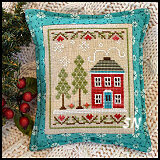 Each of the following designs has a stitch count of 59 x 67. 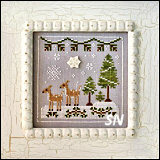 There will also be a freebie border pattern available on the CC website as soon as this is released. If the entire series is stitched together with the border, it has a stitch count of 135 x 295. 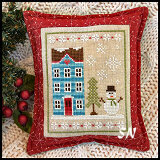 Choose any fabric you like, Nikki used 32ct Lambswool Linen. 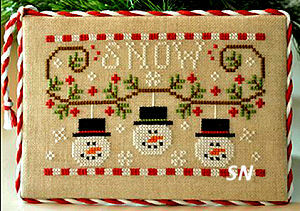 All the designs follow the same color scheme -- both DMC (12 shades from your stash) and Classic Colorworks. Design #1 releases the end of March 2018... and we'll offer an auto-ship on this set. Options include charts only, charts and threads, and/or fabric of your choice. If you want to do all the parts singly, we'll be sending your big cut of fabric with your first shipment rather than trying to match dye lots each month, and not doing a good job of it! Thread Set of CC Hand-dyeds: Snowball - 3, Jolly Holly - 3, Hazelnut -2, Really Teally - 2 and Blushing Beauty 1. 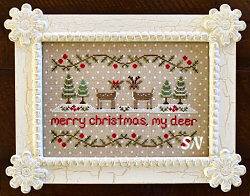 This set introduced in March of 2018, expected to finish in October of 2018. Each chart will cost $8. 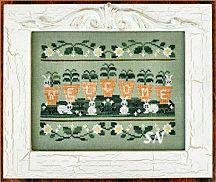 Welcome Spring is a cute row of carrots with resident garden bunnies. Each side is the mirror image of the other in this, stitch three carrots and 2 rabbits with their borders, and you've got it! 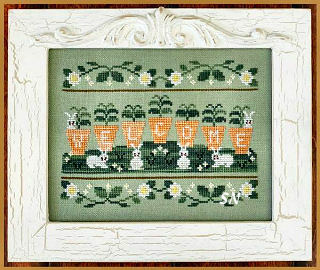 Take the letters out of the carrots, add a few beads or special stitches to them and do the bunnies with Rainbow Gallery's Wisper... a smattering of JABCO buttons in the yellow and white flowers -- lots of potential here! 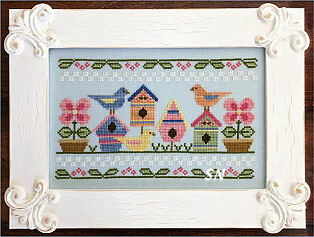 Spring Birds -- Colorful real estate... use buttons in place of the front holes in the houses... get something like Simply Wool for the birds... this would make a cute little block stand-up to prop under an open window!. Little gulls and sand dollars on the sand, this is a simple and sweet design that finishes approx 4-1/2 x 5-1/2. 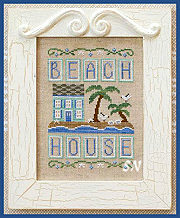 Choose a 'sandy colored' fabric, maybe add a few sandy-colored beads on the beach, maybe a little blue metallic in the water, and maybe some long stitches for fronds in the palms... and maybe purchase a beach house to display this???! 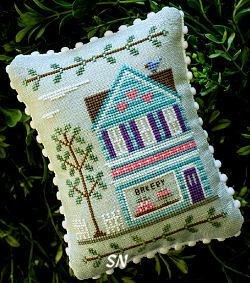 Little Stitch Dots to take you away to far and happy places! 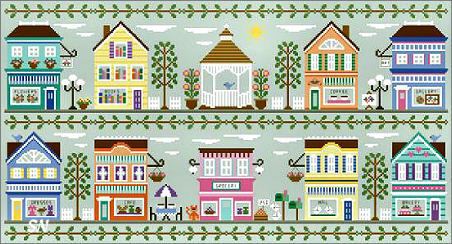 Main Street - Now Complete! This is a new series of 10 monthly charts releasing each month beginning this April continuing till January of 2018. 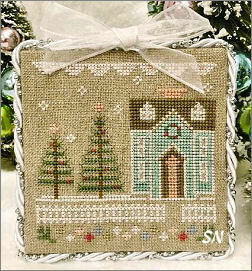 Each has a stitch count of 59 x 83 (approx 3 x 5), if you stitch it together in two rows as shown, it'll measure 295 x 157 (18-1/2 x 10). 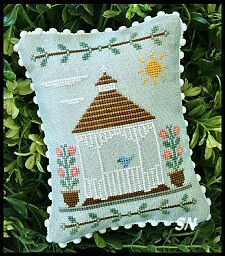 Worked on 32ct Star Sapphire Linen a yummy soft blue/aqua color... this color works for both stitching options. 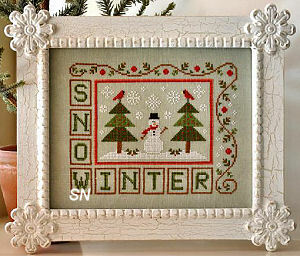 Along with several DMC flosses (3 of white), you will need 2 skeins of Classic Colorworks Cocoa Bean and 2 of Four Leaf Clover. 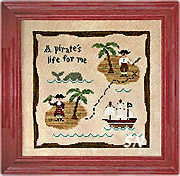 Auto-ship begins in April... main fabric cut with first shipment or individual cuts each month! 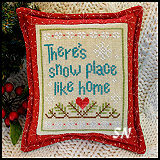 Country Cottage Needleworks is working on a new 5-part series -- *Snow Place Like Home! * One pattern releasing every month... (right now, #3 is already here), each finishes approx 3-1/2 x 4-1/2.. You can join them in one long row, then they will finish 19 x 4-1/2. 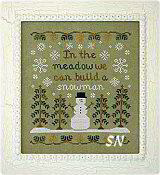 Choose any fabric you like -- the model is on 32ct Lambswool -- any neutral will do. Cute houses, a little snowman here and there... consider adding some glass beads or opalescent thread to make that snow glisten! 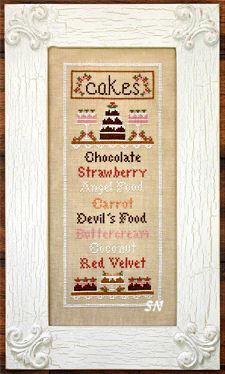 Small chart, DMC or hand-dyed flosses. 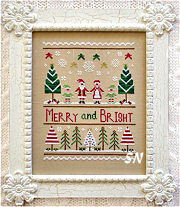 Merry and Bright measures 6 x 8 on 32ct. It doesn't call for any beads or metallics... but wow... you could really get creative with this! 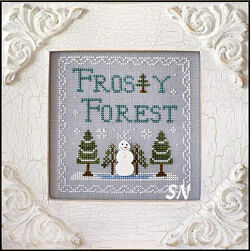 Lots of pretty metallics or buttons for the stars... Mill Hill snowflakes (either the glass or metal ones would be fun), then opalescents for shine or Wisper thread for fluff in the snow... definitely beads for those cute little trees... this is presented as a chart. 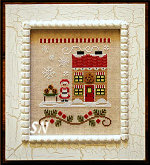 Just white, red green and black, this finishes approx 5 x 8 on 32ct. Maybe add some opalescent to the snow... some metallic to the cardinals to make them POP. There is a lot you can do to spruce this little guy up a bit -- and he'd make a cute weighted block door stop!!!! 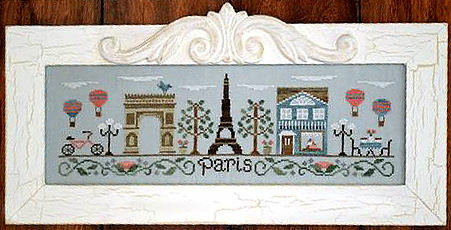 This is a charming Paris street scene by Nikki Leeman of Country Cottage Needleworks. It is worked on 32ct Star Sapphire linen (which is a yummy, pretty and light seafoamy color) and uses a combination of 12 colors of DMC and hand-dyeds. 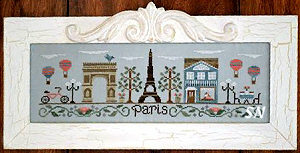 Finishing approx 13 x 4, it has so many separate design elements that you could pull out of here and stitch individually... or choose just the restaurant table and Eiffel Tower for instance... I love those balloons... and the Arch is pretty cool too! Offered as a chart. 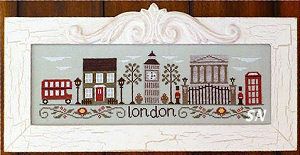 This is Country Cottage's third design in this set of little city rows -- she has London and Paris already published. So cool, the hot dog vendor is here, the park bench, Empire State Building, a taxi, a brownstone, and friendly fire hydrant for all the neighborhood dogs!!! 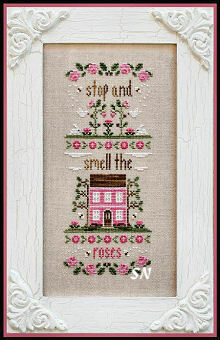 Offered as a chart, this is stitched on 32ct Waterlily linen with hand-dyeds and DMC flosses. 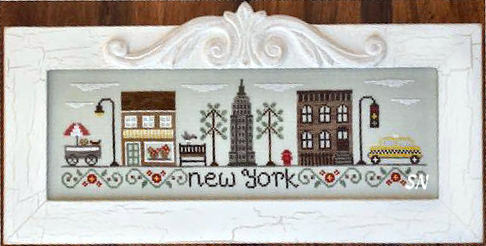 it finishes approx 13 x 4... Something fun to remember your travels to New York City!!! 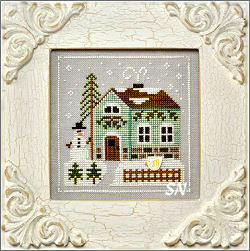 Country Cottage Needleworks has another CHARMING Famous City Street Scene! 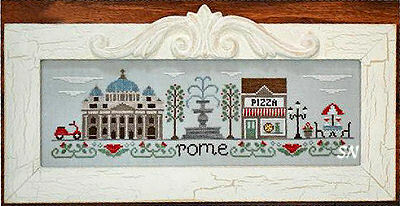 Rome is new, and joins London, Paris and New York! All four are presented in chart format. 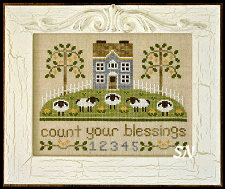 They all measure approx 13 x 4 and are worked on 32ct Star Sapphire Linen. 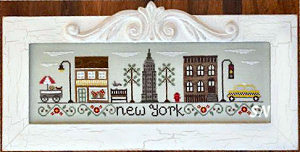 Regular DMC and hand-dyed flosses, each city scene is just the cutest... and you might need them ALL! 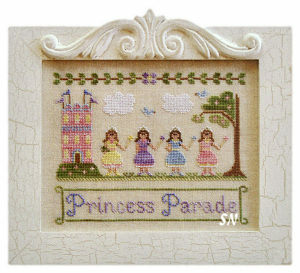 A cute companion to An Afternoon in Paris, this is another street scene with a few of the favorite landmarks of London. The double decker bus... Big Ben, and Buckingham Palace... I wish they still had those cool red telephone booths!!! 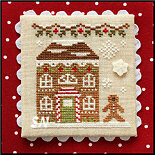 Gingerbread Village Series is Now Complete! Beginning mid-October we're being treated to a new 11-part monthly series by Nikki Leeman of Country Cottage Needleworks. 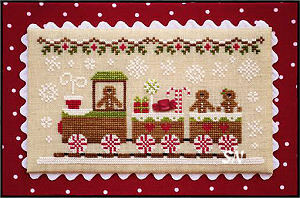 Beginning with a Gingerbread Train in the center (110 x 60 stitch count), there will be 10 more designs (55 x 60 each) surrounding it. 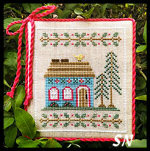 You can stitch it all on one piece of fabric, or make your own stand-up village of buildings. It will feature a few Just Another Button Company buttons, and can be worked on numerous different fabrics -- 32ct Natural Belfast, to Opalescent to the Polka Dot. 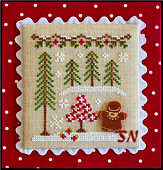 Total thread usage will be Classic Colorworks Bean Sprout (2), and Ribbon Red (2). Week's Hazelnut (3) and Pecan (5). DMC White (4), 3371 (1), 469 (1), 741 (1). Each of the 11 designs is being released separately in small chart format... so of course we have begun an auto for this!!! Please communicate to us in our comments box (or call on the toll free line 888-543-7004 -- which options you want! 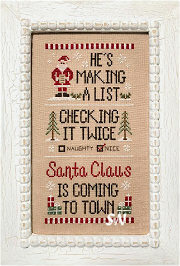 Charts only, charts and buttons, which fabric, floss or no floss... there are too many options here for me to list all the ordering combinations. 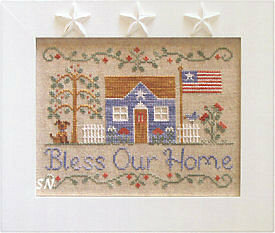 We'll send flosses and fabrics with the first shipment, charts and buttons monthly thereafter. 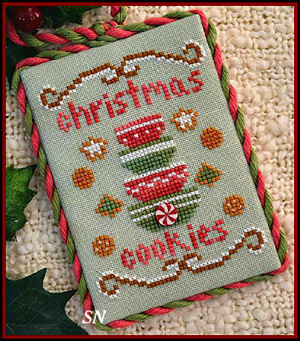 All pinks and greens... you are using mostly DMC colors with Whatley Woodlands brown and Baby Spinach green hand-dyed flosses. 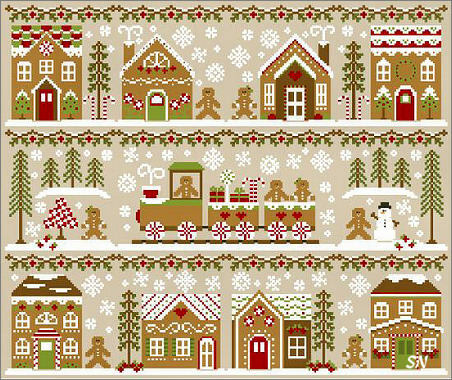 Just 4 x 8 in size, there is lots of balance in here with all the repeating motifs... look... it's the reverse design on each side! 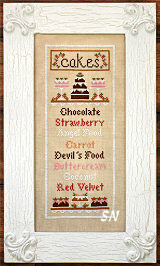 A sweet listing of life's treats, this measures 65 x 163 in stitch count and is coded for DMC floss. 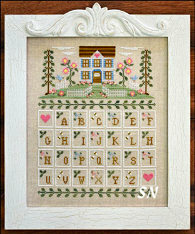 One of Nikki's pastel cottage scenes tops this organized block of the alphabet. 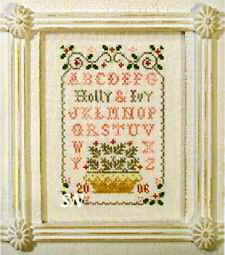 Finishing approx 8 x 10 on 32ct, stitch it by itself, or add the letters. It might be kind of fun to personalize this a little -- instead of the repeating corner motifs with the letters... change them out and add family first names or special places your family likes -- lake -- in the L space, or Disney in the D space... or Rover for the puppy in the R space... just thoughts! Offered as a chart. 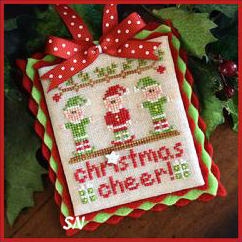 What a fun Christmas decoration -- wouldn't it be neat to personalize for a first Christmas together... or fun to display in the foyer? 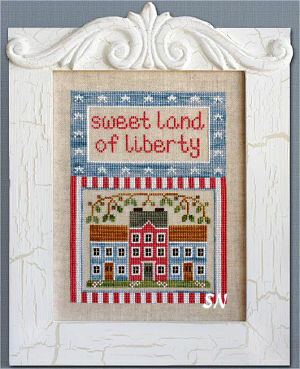 By Country Cottage Needleworks, this is offered as a chart. It is stitched on the 32ct Natural Petit Point linen that features white dots painted on. 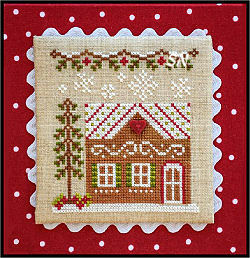 (Those little dots are way cute, but a little more challenging to negotiate than regular linen.) 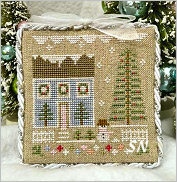 Anyway, just a few DMCs and hand-dyeds, it finishes approx 8-1/2 x 5-1/2... and the general concensus is that it is CUTE! 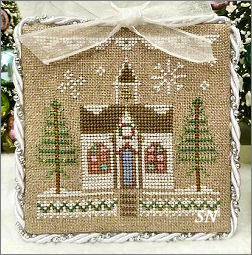 Country Cottage Needleworks presents an Advent Calendar that is bitty in size but big on charm. Finishing a mere 6 x 10 on 32ct, it's coded for DMC and hand-dyeds. 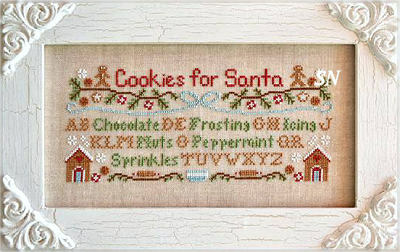 It might really be fun to frame this, and make sure there is a FAT chuck of foam board behind it, so you could stick-pin a piece of peppermint to each of the days-in-waiting!!! Offered as a chart. 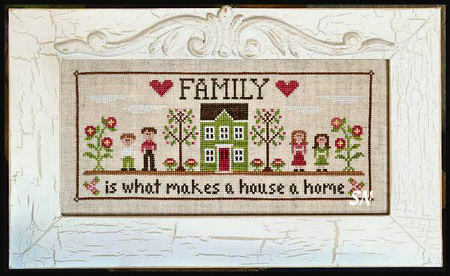 Is what makes a house a home. 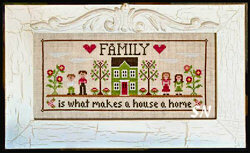 Something fun for a growing family... this might make a nice housewarming gift. 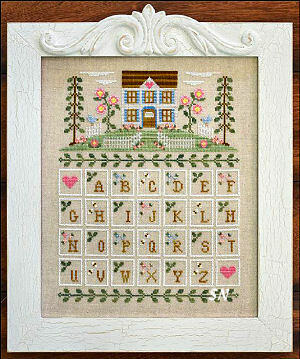 Add the family surname, you could add initials below the people... and I bet you can find a tiny dog or cat chart somewhere and add that in here too! 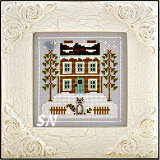 Right now, with no design changes, it will finish approx 9 x 4 on 32ct. Offered as a chart, it uses DMC and hand-dyeds. 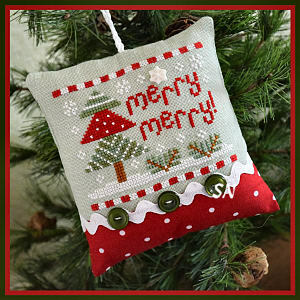 Nikki has announced her next series of designs... a set of 12 ornaments worked in the classic red and green Christmas colors. The first releases mid-August and will continue till all 12 are released. Each is offered as a small chart -- various sizes and 32ct fabrics -- each uses DMC and hand-dyed flosses. JABCO buttons are optional each time. 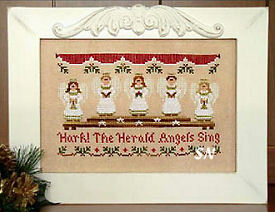 The first offering is *Angels* which measures 63 x 53 and features a bell button and Classic Colorwork's Ladybug floss. This is tough one to offer on an auto while including all the variables, so we're choosing to include the chart and button each month. 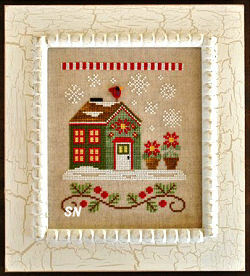 Fabric is YOUR call... and you might not need all the flosses... but as this progresses... we'll know a lot more. Country Cottage Needleworks has a charming new piece -- lots of white stitches make a wintery sampler. 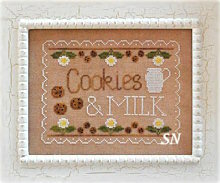 Worked on Natural Linen, on 32ct it finishes approx 5 x 8. 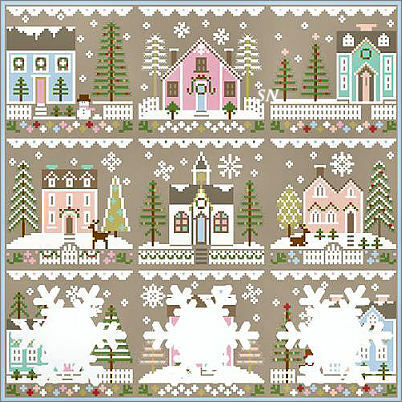 If you have some lovely deep gray or a restful blue or green, those background fabrics would be lovely for this one, as well. 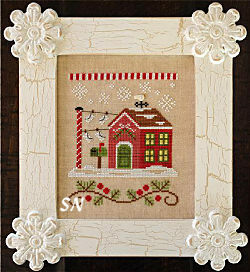 Just choose a fabric color that accents all the pretty white stitches. Maybe even blend in some opalescent metallic filament with the white??? 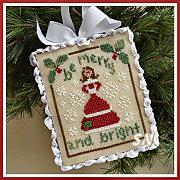 Coded for DMC, the only hand-dyed floss used is Baby Spinach by Gentle Art. 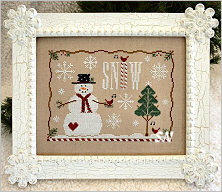 Lots of opportunities for scattered beads, a glass snowflake treasure and maybe even a little sticky-out clay carrot nose for that little snowman! Offered as a chart. 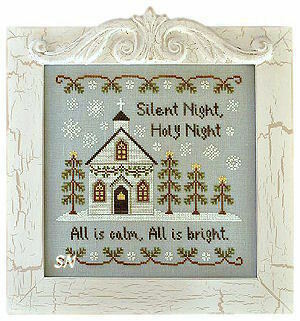 *For onto you is born this day in the city of David, a Savior, which is Christ the Lord. 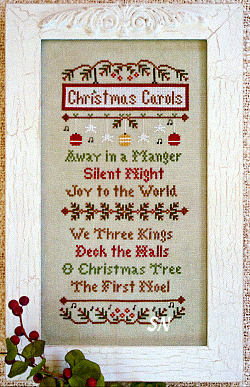 * Can't you just hear the narrator at a grade school or church Christmas pagent???? 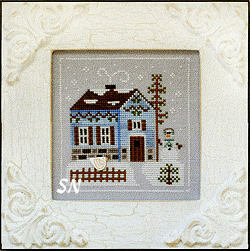 Finishing approx 3-12 x 12-1/2 on 32ct Pearl Grey linen, this is worked with 17 shades of DMC floss. 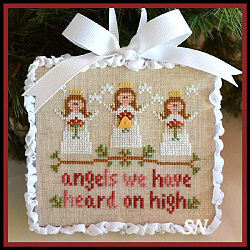 You could add some metallics to the angel, crowns and halos... and wouldn't it be neat to frame this beside some pictures of your little one's school pagent??? Offered as the chart. 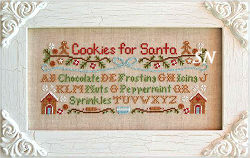 Something cute to stitch as 'The Cookie Sign' for Santa... all the topping ingredients are mixed in with the alphabet! Offered as a chart, DMC flosses, it finishes approx 9 x 4 on 32ct Lambswool. 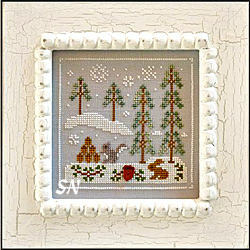 DMCs and hand-dyeds in this 6 x 8-1/2 inch piece. You may want to change the house color to stand out better against the recommended fabric, or darken that background a little. 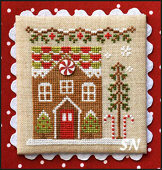 Released monthly, beginning in November of 2013, set is now complete! It's a Wintry Woodland Village consisting of nine different scenes. 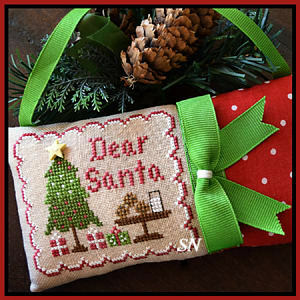 Each will release as a small chart ($6.00) with button embellishment ($1.50 to $2) -- and will individually finish approx 4 x 4. 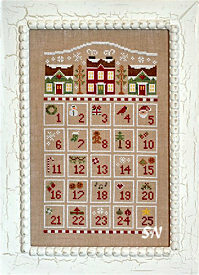 Stitch all 9 together -- 3 across and in 3 rows -- and you will need is an 18-1/2 x 18-1/2 piece. 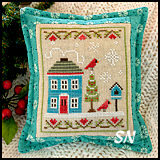 Names of the upcoming patterns conjour up a delightful village! 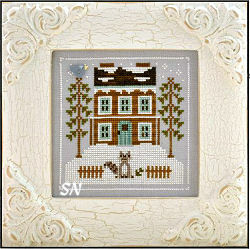 Raccoon Cabin (can you see him in the front yard? 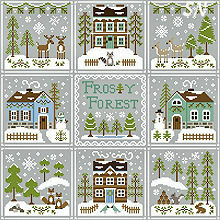 ), Snowy Deer, Snowman's Cottage, Snowy Friends, Bluebird Cabin, Snowy Foxes, Snowgirl's Cottage, Snowy Reindeer, and Frosty Forest. 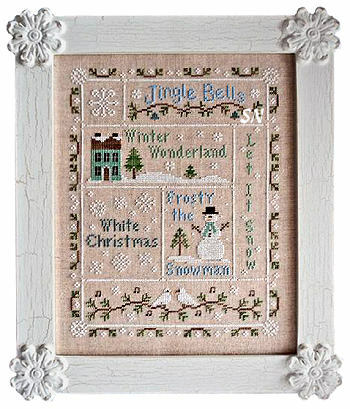 Stitched on 32ct Pearl Grey Belfast Linen, purchase one large piece for the composite pic, or enough smaller cuts at the beginning so all your individual cuts match in dye lot. 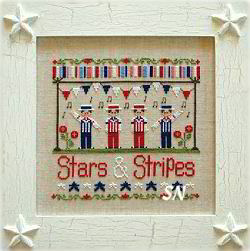 Just a sweet piece with a cute stars and stripes border to accent! A petite 5-1/2 x 7-1/2 on 32ct Lambswool, stitch it in the dusty hand-dyeds called for or DMCs. *Morning Song* brings a smile to anyone who loves blue! 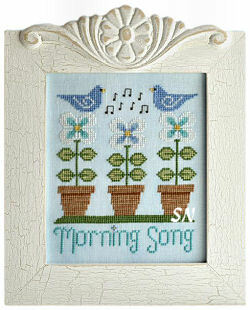 Light blue fabric, sweet bluebirds, and delicate blue flowers... everything is symmetric and organized in this piece... even the musical notes! 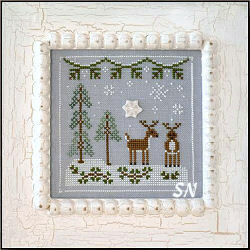 Offered as a chart, the piece finishes approx 4 x 5. 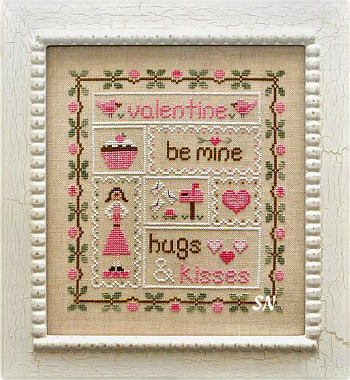 Hugs and Kisses! Pink, white and brown... strawberries chocolate and icing! 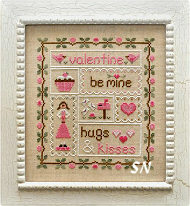 Just a sweet Valentine piece, this measures 7 x 8 on 28ct. Offered as a chart. Aren't these little guys cute? 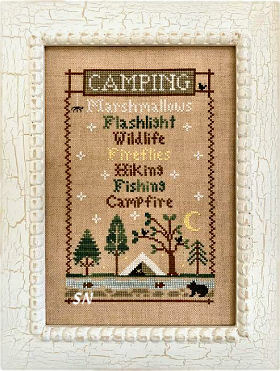 Offered as a chart, this requires only simple stitching. 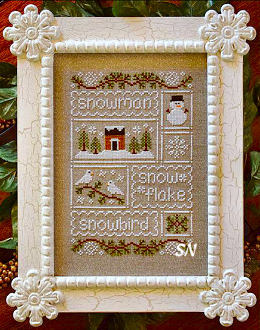 Each snowman could be worked alone for a small ornament, or larger -- like they are. We have great nose buttons that would be fun to add... and the Mill Hill white metal snowflakes would be fun on there too! 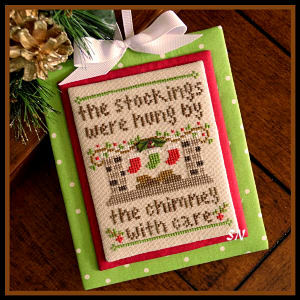 Classically cute! 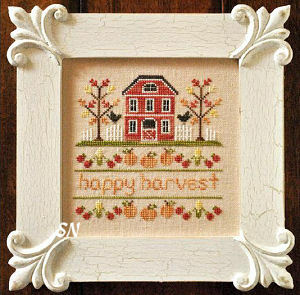 A cheerful barn-like farmhouse surrounded by the Autumn trees, a garden full of plump pumpkins and BIG, hungry crows in the yard! 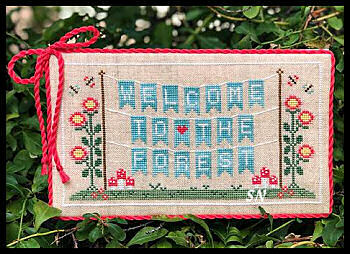 I'm kind of a random person sometimes -- so I think it'd be fun to shake up that bottom border a little -- rearrange the veges a bit and add a couple beneath the trees. Maybe even drop a leaf or two. Offered as a small chart, it finishes approx 5 x 5 on 32ct. Country Cottage Needlework's Santa's Village -- 2013! Nikki Leeman has announced brief details for her new 2013 series of designs -- Santa's Village. 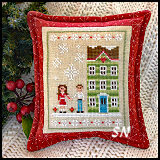 The first design ships the last week of November -- entitled Santa's House. 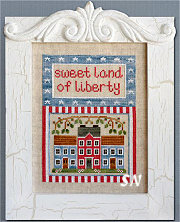 All the rest in the set will ship one-chart-per-month for a total of 12 designs. Each chart is a different building in her village, here are the names -- in the order they will be released. 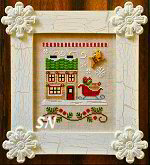 Santa's House; Poinsettia Place; North Pole Post Office; Mrs Claus' Cookie Shop; Santa's Stocking Store; Reindeer Stables; Christmas Tree Farm; Candy Cane Cottage; Santa's Sleighworks; Gingerbread Emporium; Elves Workshop; and Hot Cocoa Cafe. 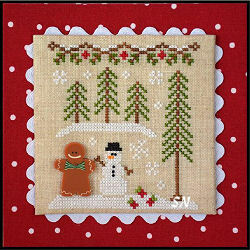 You can stitch them all individually, or join them on one piece of fabric -- each has a stitch count of 72 x 88 -- which finishes approx 4-1/2 x 5-1/2 on 32ct Lambswool linen. 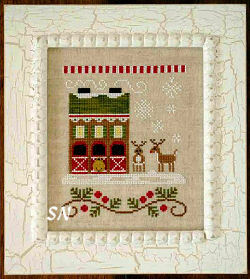 Suggested group placement is 3 rows of 4 buildings each - which requires a 24 x 24 cut of the linen. 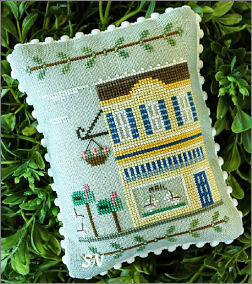 There is also a button featured on each building for a little extra charm! Soooo... you have options here! Pick up each chart as you like it... or join our auto-ship for the set. Next decide on fabric. 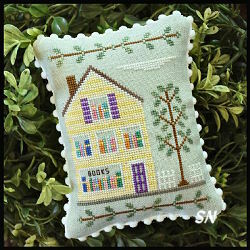 You can stitch these on just about anything -- YOU CHOOSE your favorite -- and let us know what you'd like best. 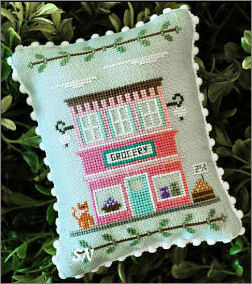 Big chunk or enough to stitch individually? (Need to purchase all smaller pieces together so dye lots match...) This promises to be a cute set of designs... and we can help with all those decisions!!! 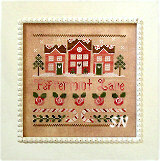 Here is a pic of one of the shop Gal's stitching in progress!!! 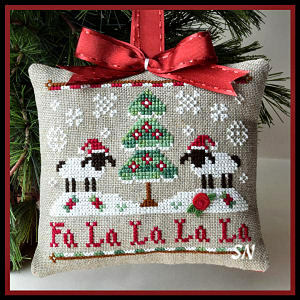 Deanna's stitching is over one on 28ct Lambswool! 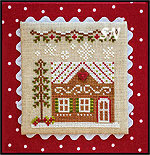 Auto begins with Santa's House in December of 2012, and will end in November of 2013. If you join this auto anytime in 2013, you have the option to CATCH UP - meaning you'll get all the previously released months -- OR simply begin with the current month's release. You will continue till the end. Click here to choose what you'd like Santas Village #1 Santas House Chart w button - $7.50 Santas Village #2 Poinsettia Place Chart w button - $7.75 Santas Village #3 North Pole Post Office chart w button - $7.25 Santas Village #4 Mrs Claus Cookie Shop chart with button - $7.50 Santas Village #5 Santas Stocking Store Chart w button - $8.00 Santas Village #6 Reindeer Stables Chart w button - $7.75 Santas Village #7 Christmas Tree Farm chart w button $7.40 Santas Village #8 Candy Cane Cottage chart w button - $7.60 Santas Village #9 Sleighworks Chart w button $10.50 Santas Village #10 Gingerbread Emporium w button $8.50 Santas Village #11 Elves Workshop w button $7.50 Santas Village #12 Hot Cocoa Cafe Chart w button $7.50 Santas Village all 12 charts w buttons $94.75 24 x 24 Cut 32ct Lambswool for CC Village Complete - $51.84 HELP! 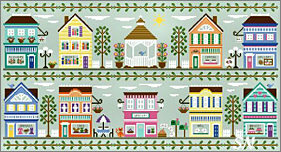 Contact Me About My Fabric Questions! 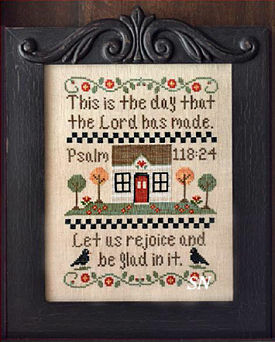 Offered as a chart, stitched with DMCs and a few hand-dyeds, it finishes approx 6 x 8. Oh, a cute balloon scene!!! 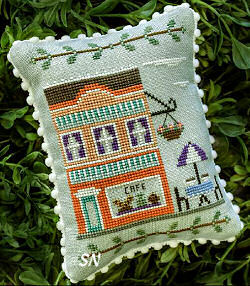 Stitched with Crescent's Persimmon, Mint Julep and Joshua Tree hand-dyed colors, we never see hot air balloons in things... so this is distinctive. 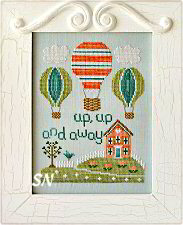 Little House did release Around the World in 80 Days... another balloon piece... so enjoy them both! 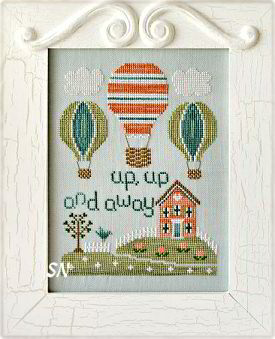 (We had a customer years ago who was *into* hot-air ballooning -- the hubby/hot-air jokes were delightful, and this just makes me smile to remember her.) 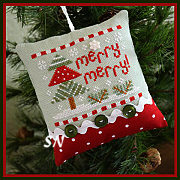 Fun colors... maybe personalize a balloon for a little one??? 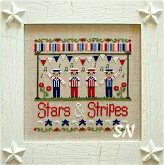 A favorite barbershop quartet is singing away... probably at the bandstand in the center of town on the 4th of July!!! 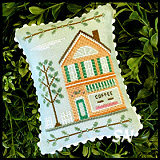 Finishing approx 6-1/2 inches square! Soft Spring colors of pink and green, a pair of little bunnies are letting the bees get to them!!!!!! Offered as a chart, this finishes approx 6 x 6 on 28ct Lambswool. 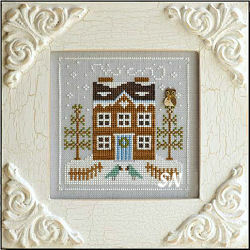 Country Cottage Needleworks has a new winter-y piece -- on the *Very-Cute* side!! 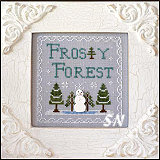 A little snowman built between two very organized pine trees, we like that unbalanced border that ads lots of interest to the design. 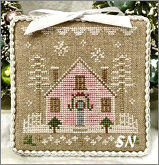 Offered as a chart, this measures 117 x 89 -- approx 8 x 6-ish on 28ct. 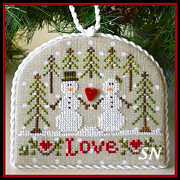 I think it'd make a cute hanger over a doorknob for the winter season! DMC flosses. 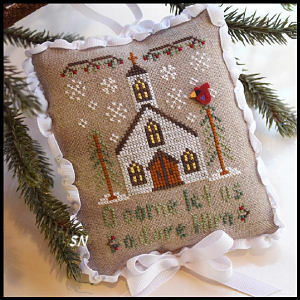 A very organized and balanced country church with snowflakes in the sky and groomed evergreens in the yard, the linen in this is not hand-dyed -- so it adds to the simplicity of the message. 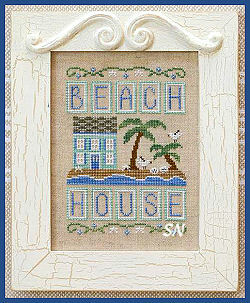 Stitched with hand-dyed White Lightening for the clapboards on the building, this is just a pretty piece. 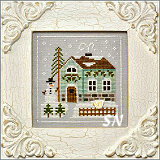 Worked on 32ct Pearl Gray it finishes approx 7-1/2 inches square. Offered as a chart. 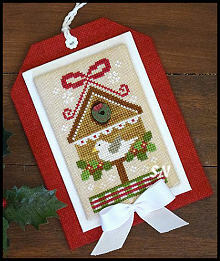 Country Cottage has a festive Holiday piece... glass ornaments hanging beneath perky bows... this finishes approx 5 x 10 on 28ct Lambswool linen and is stitched in a combo of DMC floss and Weeks handyeds. 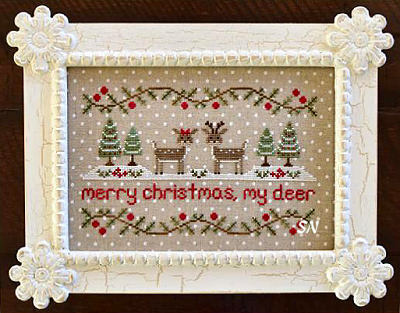 I like the two borders, they'd be pretty wrapped around a basket or candle... Offered as a chart. The bestest comfort food snack! 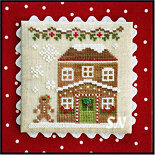 Finishing approx 5-1/2 x 7-1/2 on 30ct Cocoa Linen, coded for DMC or hand-dyeds. 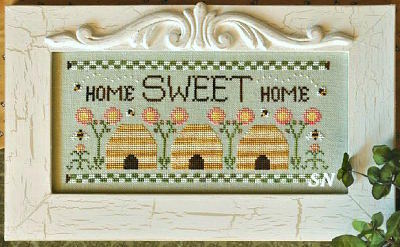 Well... beehives WOULD be quite sweet homes... so what better abodes to welcome! Offered as a chart, this finishes approx 4 x 9 on 28ct and is stitched in DMCs and hand-dyeds. 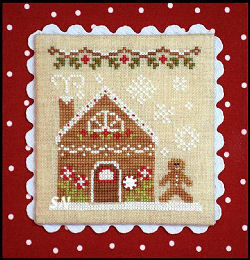 Why not add a bit of zest to those beehives by adding some fun special stitches? 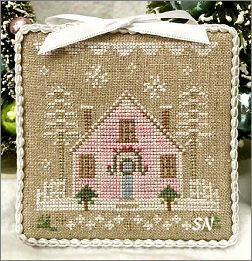 You could make the stripes different, or stitch each hive in a different set of stitches. You could add some honey-yellow beads to them, add some black beads to the flower centers, add some tiny bee embellishments... this has lots of opportunity! The fruits of summer, both look yummy in their charming pottery bowls. 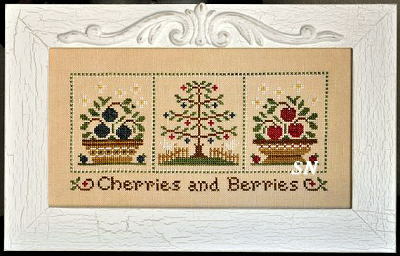 I think there is a bit of 'artistic license' with those blueberries in the tree, though! 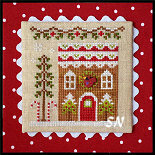 Offered as the chart, this finishes approx 4 x 9 on 28ct. 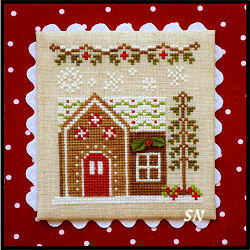 If you are an over-achiever, you could stitch the 'bowl' squares and make them jam jar labels!!! Housewarming gift? 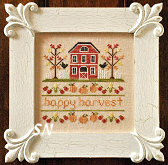 Country Cottage's newest, this finishes approx 8-1/2 x 5-1/2 on 28ct Lambswool linen, and is stitched in DMC and overdyeds. 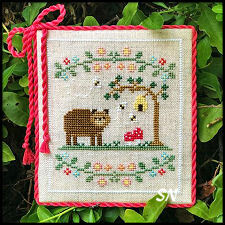 Here's a cute piece stitched on Week's 30ct Scuppermong linen in 5 Crescent Colours hand-dyeds of Bamboo, Bramble Bush, Blackbird, Hazelnut and Steamed Broccoli. Finishing approx 7-1/2 x 8-1/2, you could stitch just the evergreens and snowman for a mini-version! Pretty colors in this one, offered as a chart. 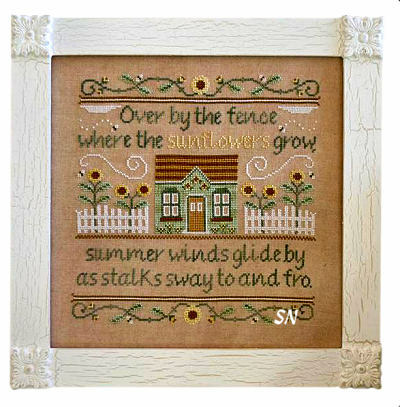 *Over by the fence where the sunflowers grow, summer winds glide by as stalks sway to and fro. 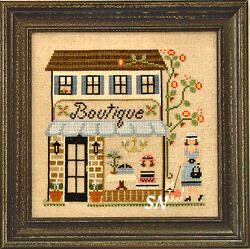 * The cute farmhouse, the garden of sunflowers, and the busy bees everywhere... this finishes approx 9-1/2 inches square on Weeks 30ct Cocoa Linen. 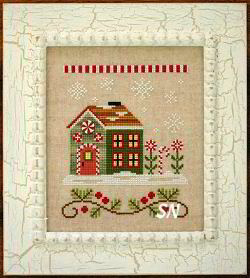 Stitched with a combo of overdyed flosses, it doesn't call for any bee embellishments, but little bee buttons everywhere would be really cute! 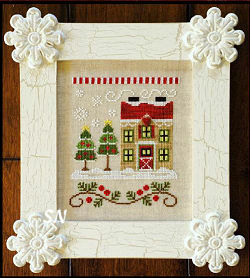 Country Cottage Needleworks has released two new designs to adorn your walls during The Holidays. 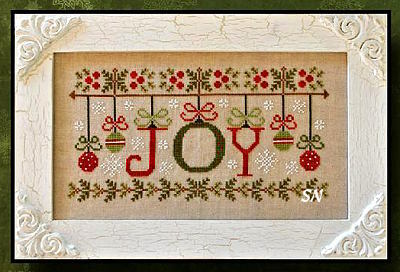 Charted for DMC flosses, 5 x 11 and 4 x 9... both would be pretty finished into fabric wall hangings -- for a burst of bordering color. 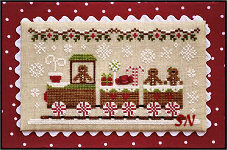 Festive and Quick! Some pumpkin grow white these days... I just bought one! 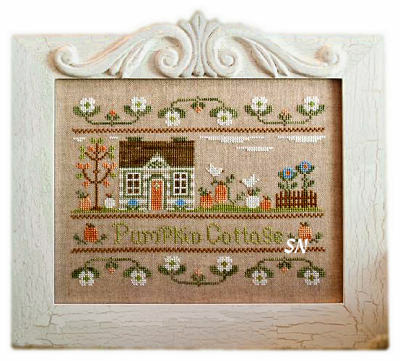 So... our little cottage looks like a white pumpkin, and it does have some growing in its garden... but there are orange ones, too... for a bit more color, and really great pie! 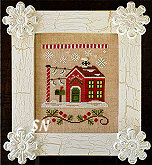 Pumpkin Cottage finishes approx 6-1/2 x 8-1/2 and is charted for either DMC or overdyed flosses. 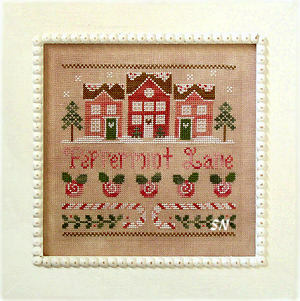 Just like her Little League ball players and pirates, this can be a remembrance of special years gone by. 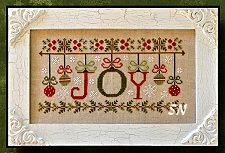 Offered as a chart, it finishes approx 5 x 8 on 28ct., and uses DMC and overdyed flosses. I can just hear those salty pirates singing away! 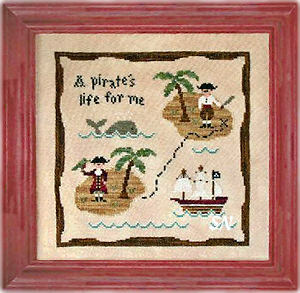 to keep those pirates singing! Real cute! 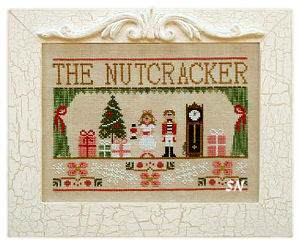 Country Cottage Needleworks releases a darling padgent scene -- straight from The Nutcracker Suite! 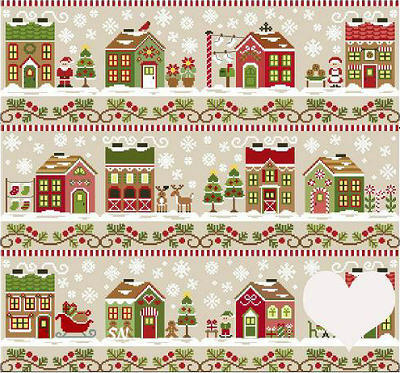 Clara, the Prince, Christmas Gifts everywhere and even the theatre curtains... this is darling! Stitch it for the star-performer in your life!!! 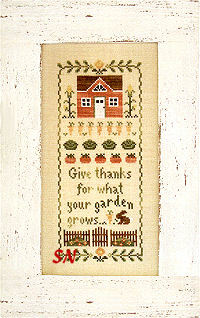 Offered as a chart, this is one of Country Cottages newest releases... very timely for the season! 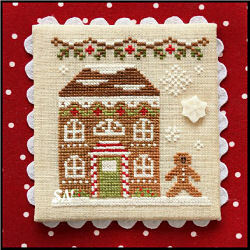 Cute cottages, complete with candy sprinkles on the rooftops! 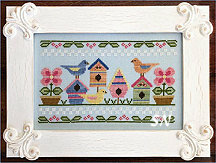 Country Cottage has two new designs that are perfect for young bedrooms! 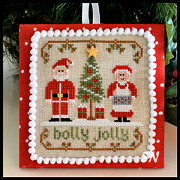 I picture best friends depicted in both of these... customize some hair colors, add some names of the featured foursome of friends... and you have lasting memories of days -- soon to pass! 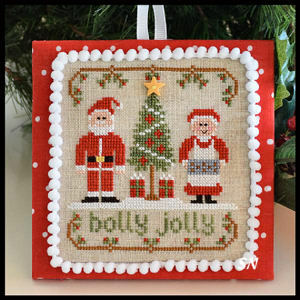 Both are offered as charts, stitched on 28ct, they finish approx 6-1/2 x 8-1/2, and are stitched in DMC and overdyed flosses. Very, very cute!!!! 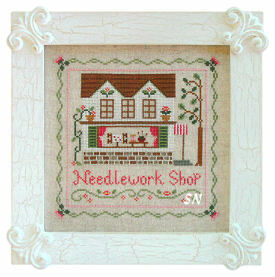 A companion to The Tea Room, Country Cottage Needleworks brings us an inviting little store front! The lovely window display is ready for shoppers... and it looks like they have a classroom upstairs, too! 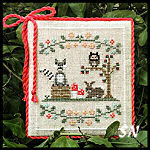 Offered as a chart, it finishes approx 8 x 8 on 28ct linen, and is worked entirely in DMC flosses. Quite the charming and classic All-American Home... complete with puppy in the yard... that brave flag is part of the landscape! 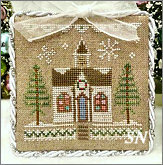 Stitched on 28ct in wonderful 'faded glory' colors of DMC and Crescent Colours overdyeds, this finishes approx 6 x 8. 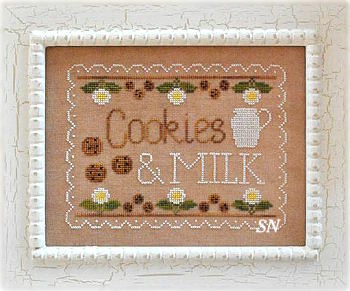 I think the puppy's eyes are French Knots... but the rest is regular crosses. 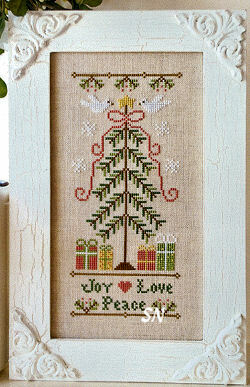 Something quick and classy for your foyer or family room. 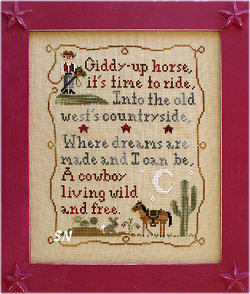 Giddy-up horse, it's time to ride, Into the old west's countryside, Where dreams are made and I can be, A cowboy living wild and free. 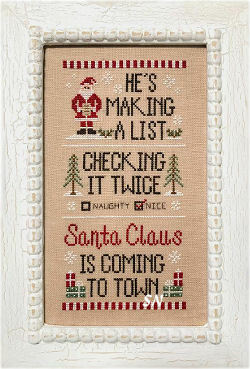 I can just imagine this hanging in a playroom or little boy's bedroom... I think it's precious!!! 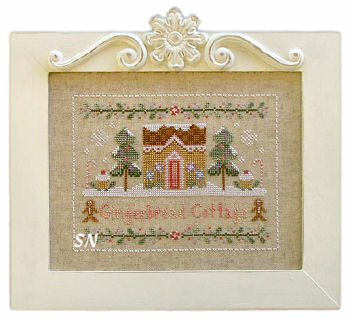 Offered by Country Cottage Needleworks in chart format, this finishes approx 8 x 9 on 28ct, and is worked in Crescent Colours overdyeds and DMC flosses. 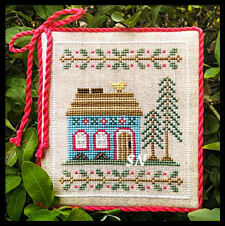 I like the colors... the rope border is cute; so are the stick horse and prickly cactus in here! 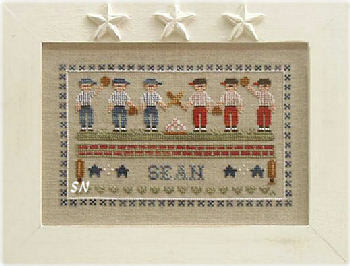 4th In CC's Kids set of designs... the first two were for ballerinas and baseball lovers. 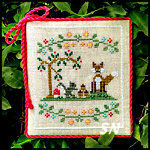 This one and the Garden Girl -- also new -- are perfect for other special little kidlets!!! 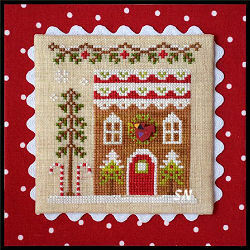 What a cute, whimsical Christmas House! Tucked between two very lacy holly borders, you find a candy cottage, complete with lollypops for the shrubs! 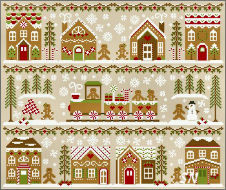 The pine trees are decorated with candies, and notice the cupcakes and candy canes as the extra landscaping!!! 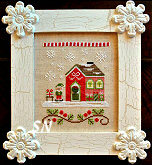 The little cookie family is standing beside the cottage sign... all very quaint and magical. 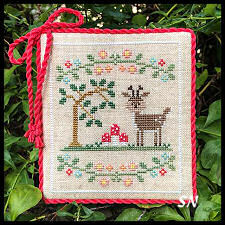 Offered as a chart, this finishes approx 6 x 8 on 28ct linen, and is stitched in Crescent Colours Overdyed floss, and some DMCs, too. 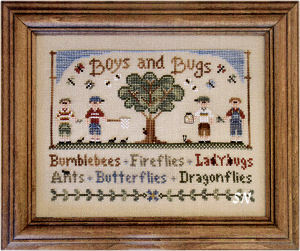 Well, I have a grandson this would be perfect for... oh, if only I stitched! (No, your Weary Webmaster, writing this description in Lindy's absence, doesn't stitch... isn't that ironic?) The design has a historic flavor that reminds me of the time of the old NY Yankees... Babe Ruth and all that. Stitched with Crescent Colours threads, it measures about 8 1/2 x 5 1/4, and comes with an alphabet so you can personalize it. 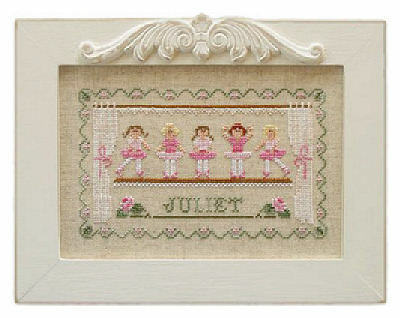 Little Ballerinas, a design for dancers and those who love them, is the same size, and also includes the alphabet. 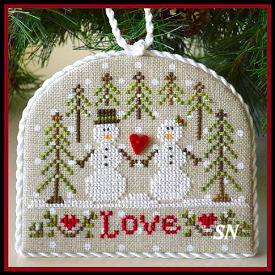 The overdyed threads used in some areas give you more dimension, don't you think? 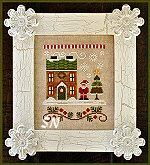 Country Cottage's newest shop-front scene... this needs to hang with The Bakery and The Flower Shop designs. 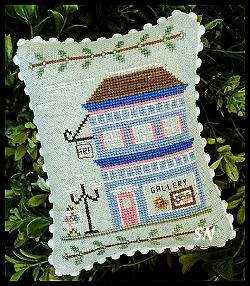 I wish this was the way The Silver Needle looked from the outside... we'd have that whole second floor as a stitching lounge! And... I could be outside walking my little Westies!!! 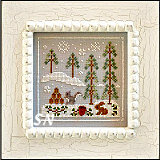 Offered as a chart, this is stitched on 28ct and finishes approx 7-1/2 inches square, worked in DMC flosses. 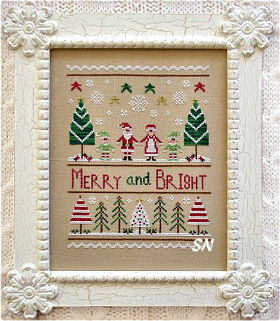 Crisp and fun! 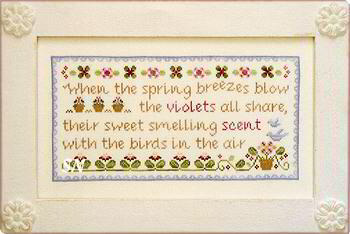 When the spring breezes blow, the violets all share, their sweet smelling scent with the birds in the air. 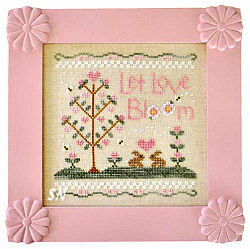 A sweet Springtime piece... if you start it now... you'll be done in time for those blossoms! Offered as a chart, this finishes approx 6 x 13 on 28ct, and uses a mixture of Weeks and Crescent Colours Overdyeds and a few DMCs too. 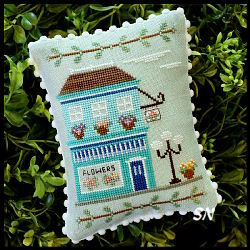 Very pretty, vibrant lavender and greens! 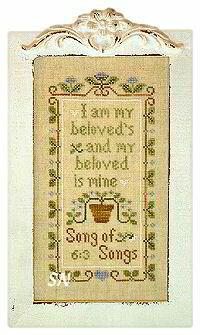 'I am my Beloved's and my beloved is mine' reads the verse on this simple piece. 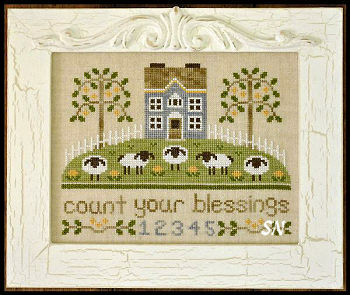 What a pretty sentiment for a wedding remembrance, or anniversary piece! 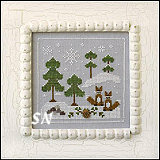 Offered as the chart, this finishes approx 4-1/2 x 9 on 28ct, and is stitched in soft overdyeds. 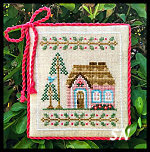 A petite 4 x 7 on 28ct, this is a soft mixture of green, straw and rose overdyeds. 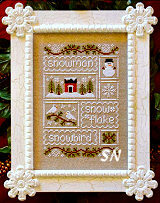 Nikki's latest design (helped along by her daughter Juliet, we're told) contains an original verse and a lovely winter setting for you to enjoy. 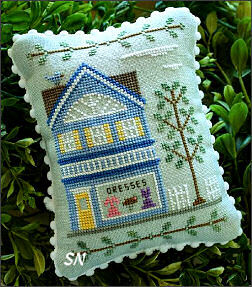 Finishing 11 1/4 x 7 1/4 on 28 count Pearl Grey linen, it calls for both Crescent Colors and DMC flosses. 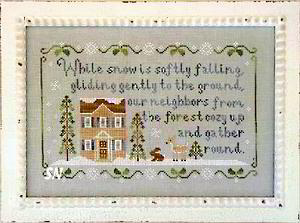 A wonderful addition to a winter wall. Offered as a chart, this finishes approx 4 x 10 on 28ct Light Mocha Cashel Linen, and is stitched in DMC, Crescent Colours and Sampler Threads overdyeds. 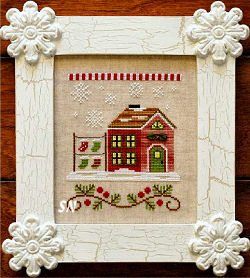 Pretty hanging by the window that overlooks your garden!